I've sneaked ahead on my Barns project. See how Lori is instructing the latest progress here. When I started this project I had a vision of how I wanted to put my barns together. 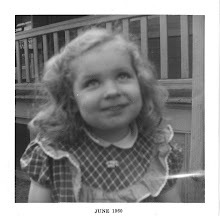 When I saw Lori's tutorial I decided to incorporate what I tentatively planned with what she suggested. I scrappy sashed my barns since I had 12 already completed and was ready for this step. But I wanted to enhance the look of hex signs in the barns so I changed the sashing up a little with the red diamonds created in the middle section of the quilt. It just seemed more "hexy". I like how it came together and I have the finished flimsy sketched in my head with just 2 more steps. I hope Lori doesn't mind me working ahead and changing things up some. These barns and hex signs have been really fun to work on. I'm going to miss making them. A barn is somewhat of an extension of a house, right? Maybe that is why I liked creating them. 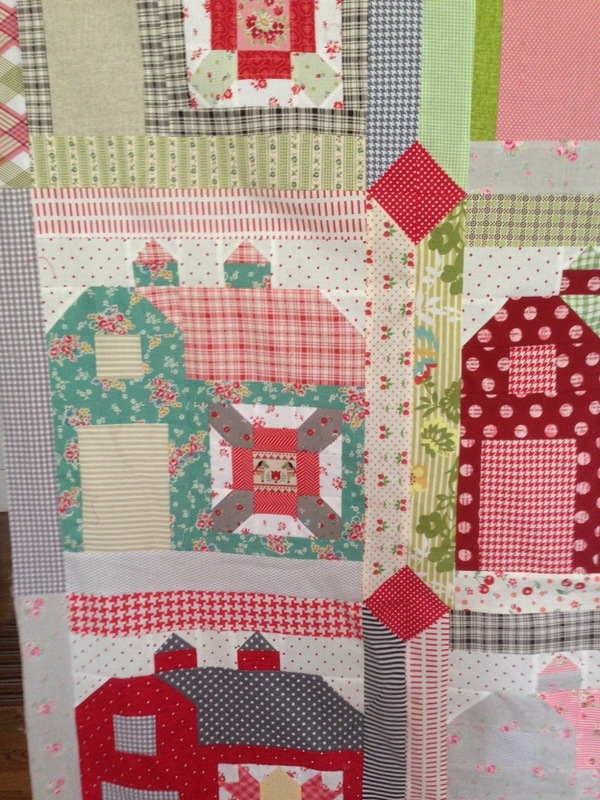 We all know I like quilt houses. Love it Nanette! You are such a gifted quilter. I just love seeing what you come up with. A very cheery quilt... so fun! Love the bright colors. And the sashing... Nice to have a project just about done too, eh?! I love this. The barns are amazing! But that's what making quilts is all about, isn't it? Taking one person's design and making it your own. Love what you've done! The barns are great. And I love the different sashings! Looks great. As usual your colours are gorgeous! Can't wait to see the finished quilt. Each and every little barn is adorable!! 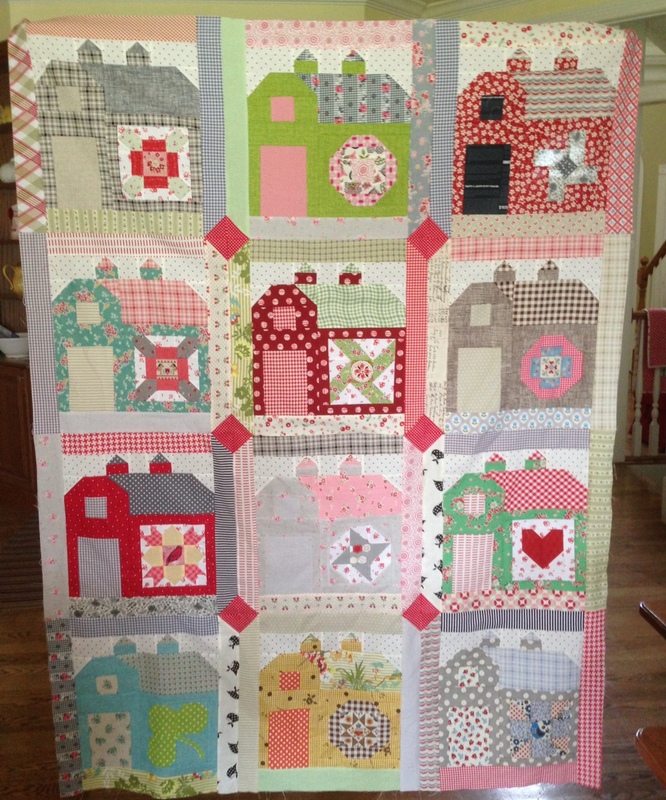 I love this quilt, it's sweet and fun and happy! Every barn has a sweet personality with unique touches! It is just adorable that you tied the whole theme together with these red diamonds in the sashing. Great idea! love this. The barns are amazing and each one has it's own charm! So cute! Each barn is wonderful! Oh my goodness, these are so stinkin' cute!!! Your quilt is so cute! 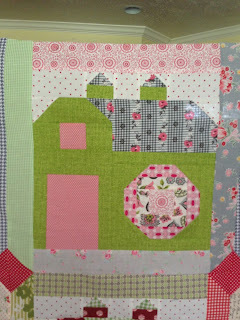 I don't want to make any more red barns now-- I need pink and green ones! Aaaah-mazing! I like your hexy's in the quilt - it gives it more of a punch and I love the barns. I'm going to have to make one of these for myself! Nicely done!!! Very nice Nanette!!! !....I love it! You say you are going to miss making barns???? 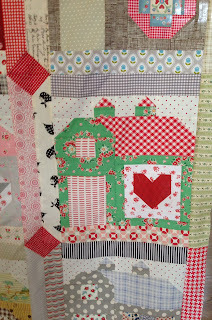 There is still one more quilt to go in the Quilty Barn Along....don't quit now!!!! Oh it's so cute. Love the ligthter pastelish colors! and that cute sashing.. I might have to incorporate that into my civil war quilt! From the first picture, before I read your entry - I thought, those red diamonds are the perfect touch for this quilt. I can wait to see the finishing touches. Great job!!! Love it! can't decide which barn I like best. Great quilt Nanette I love houses too but your barns are just fantastic! 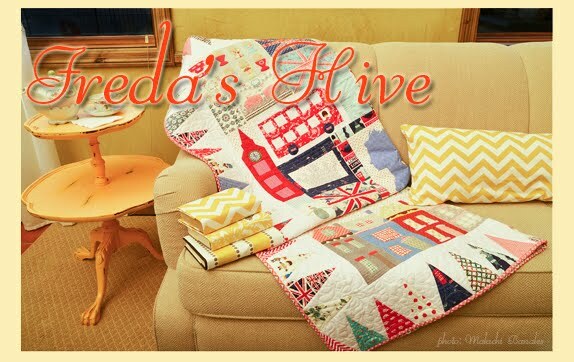 This quilt touched my heart! It is sooooo loo overly! That turned out great! I'm betting you don't get in trouble for going ahead of the rest of the class.